The introduction of the women’s division and the male Under-19 division, of the 2018 Digicel/ Hairoun Brewery/ Breakaway Masters football tournament, has brought to the fore some of the emerging national football talents. Among those who lit up the Grammar School Playing Field was System Three’s Aaron Jackson, who was adjudged the Under-19 player of the tournament. Meanwhile, the corresponding player of the tournament in the women’s division was Teosheba Culzac of K & R Strikers. Winning the most goals award in the Under-19 division was Volcanoes D’ Nielsen Lewis, with the National Under-15’s Sonya Mc Kie, topping the goal-scoring in the women’s division. 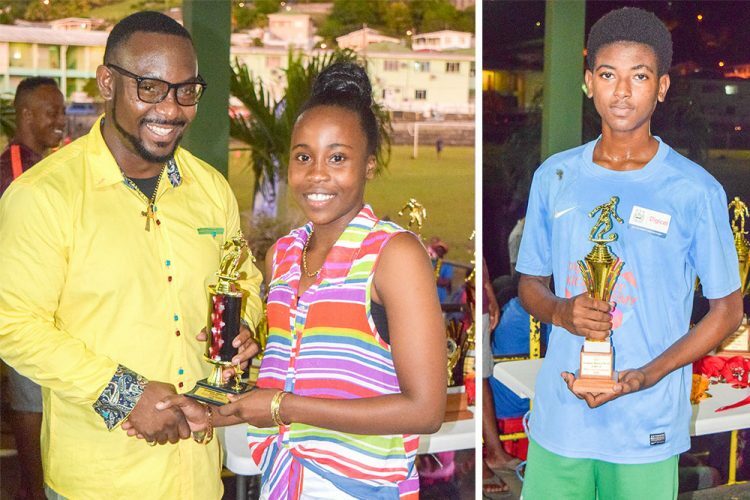 In the goalkeeping department, Volcanoes’ Carl Ragguette was adjudged best in the Under-19, and in the women’s division, the awardee was Altica Benn of System Three. Je Belle was named as the most disciplined team in the Under-19, and the National Under-15 got the nod in the women’s division. System Three won the Under-19 league title and Volcanoes, the knock-out, while in the women’s division, K & R Strikers won the league and System Three, the knock-out. Both divisions, which were sponsored by the St Vincent and the Grenadines Football Federation (SVGFF), added to the already established Agriculture Under-16 and the senior men’s division.